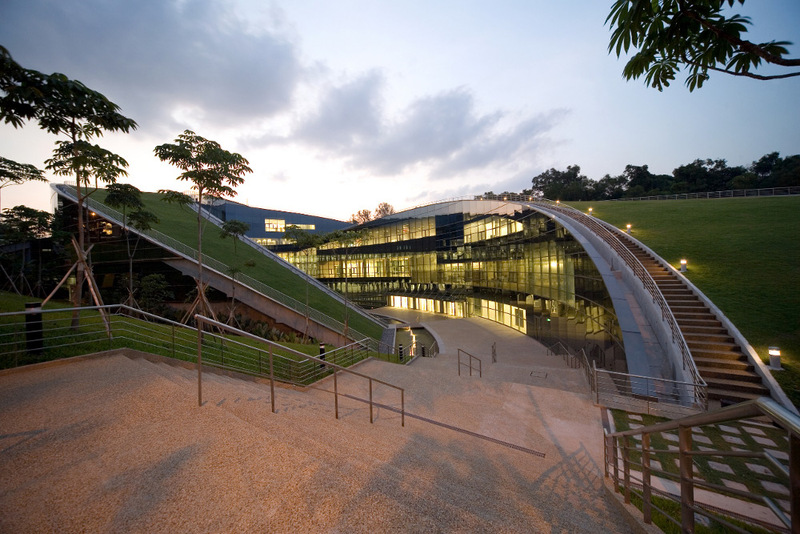 The Nanyang Technological University School of Art, Design and Media is an elegant weave of creativity, engineering and environmental consciousness. 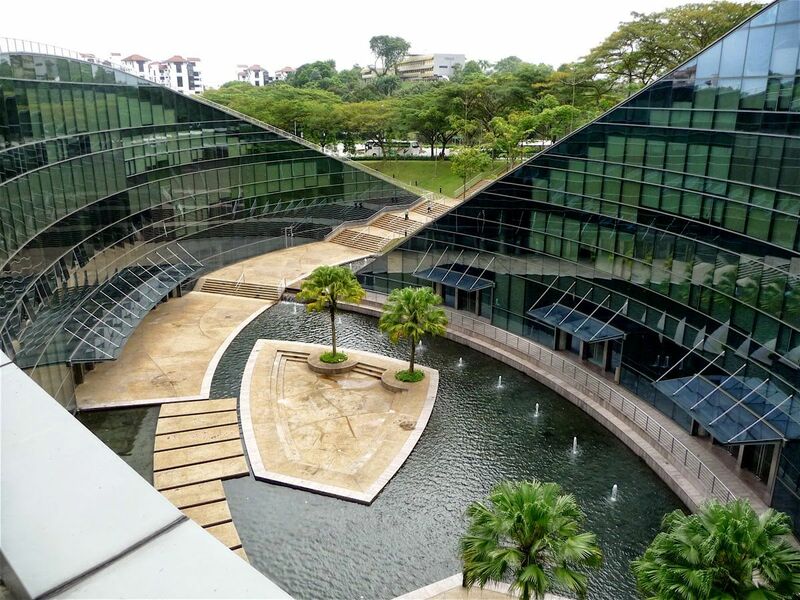 Designed by Singapore based CPG Consultants, the building stands at an unassuming five-storeys while covering 20 000sqm, housing more than 20 studios and laboratories, prototyping rooms, galleries, and numerous lecture halls, alongside classrooms. It also boasts a soundstage, a 450-seat auditorium, as well as a library. 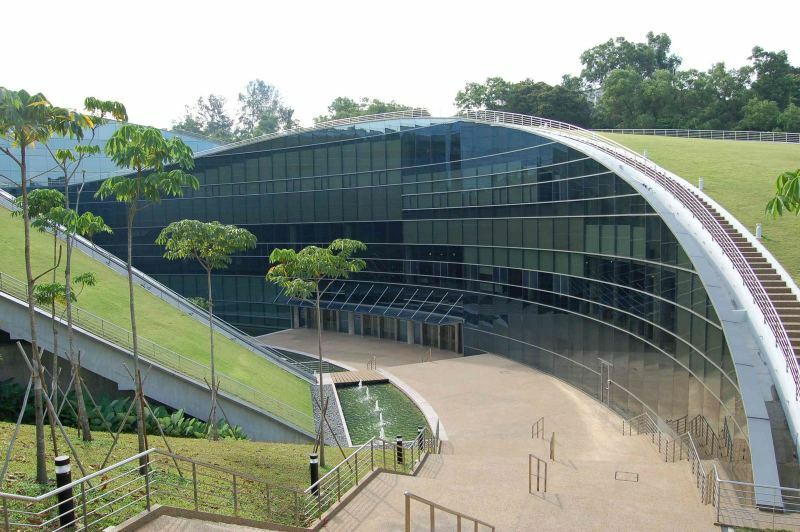 But, as is evident, the most prominent feature of the building is its lush and expansive green roofs. 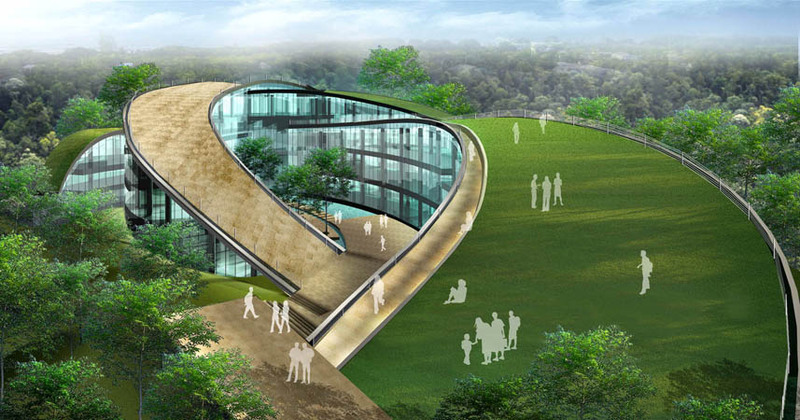 According to the master plan of the 200-hectare university campus (the largest in Singapore), the site where the building sits is a wooded valley originally intended to be left as a green lung. 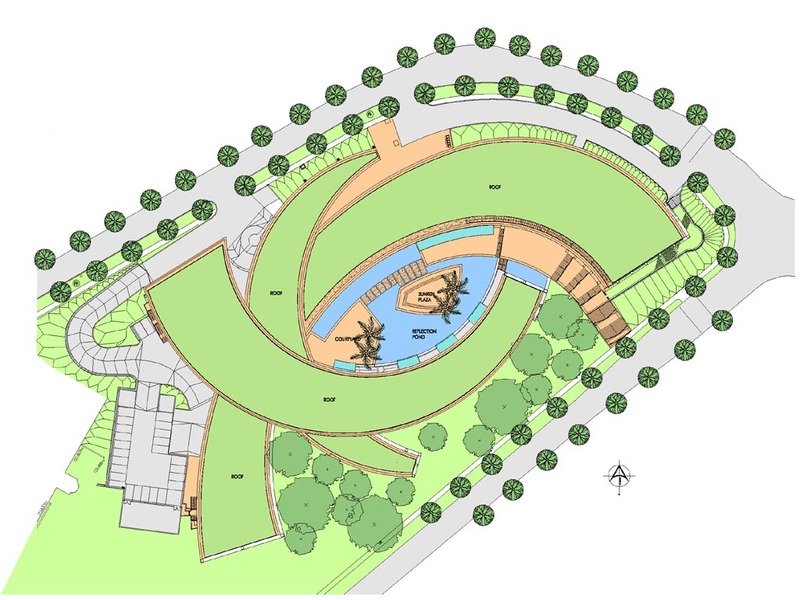 To preserve this intention, the design had to integrate not just landscaping, but a green programme that would allow the native vegetation of the site perpetuate. This requirement was instrumental in shaping and moulding the design. 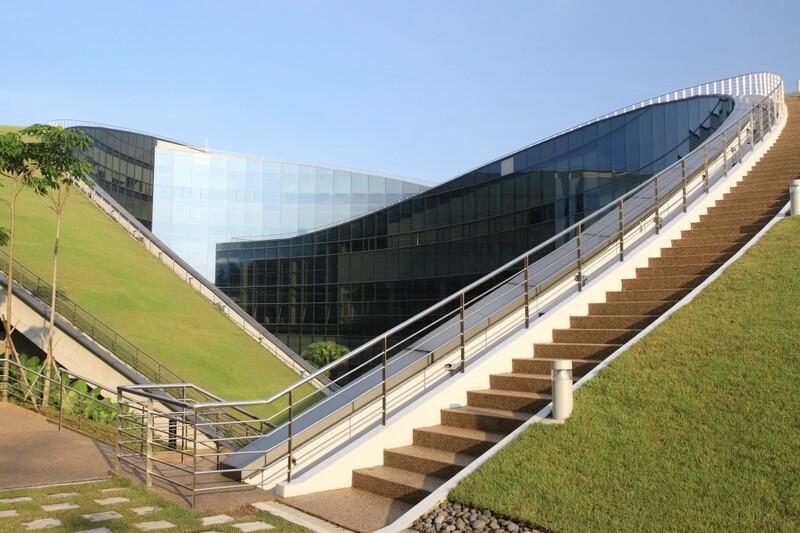 Described as a “non-building”, the structure features three sweeping curves that slope, taper and interlock. 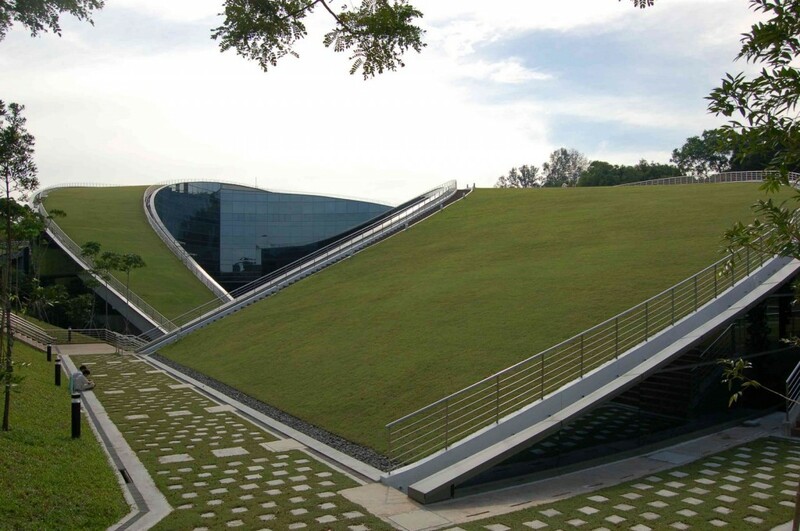 Atop the interlocking curves is a dense voysia matrella grass turf which forms the green roof. 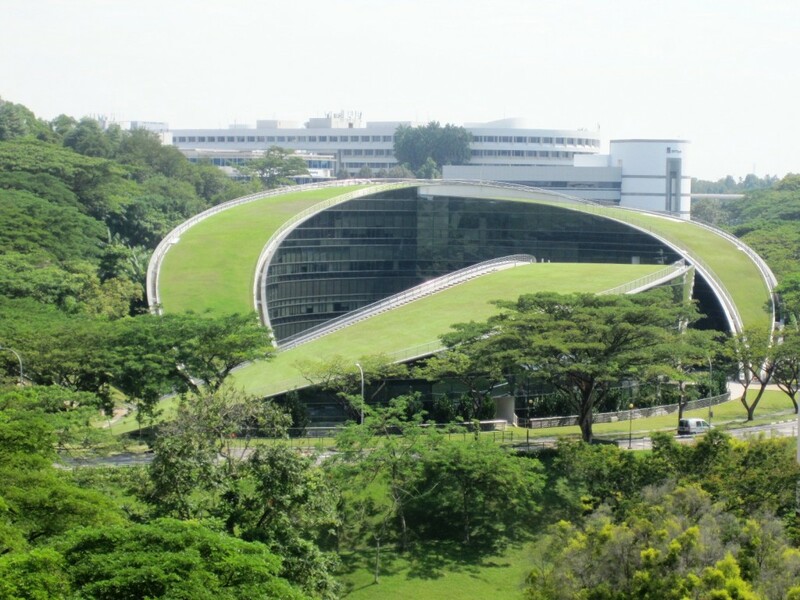 Aside from the aesthetic appeal, the green roof helps to absorb the intense sun and reduce thermal gain within the building, more or less a natural form of insulation. 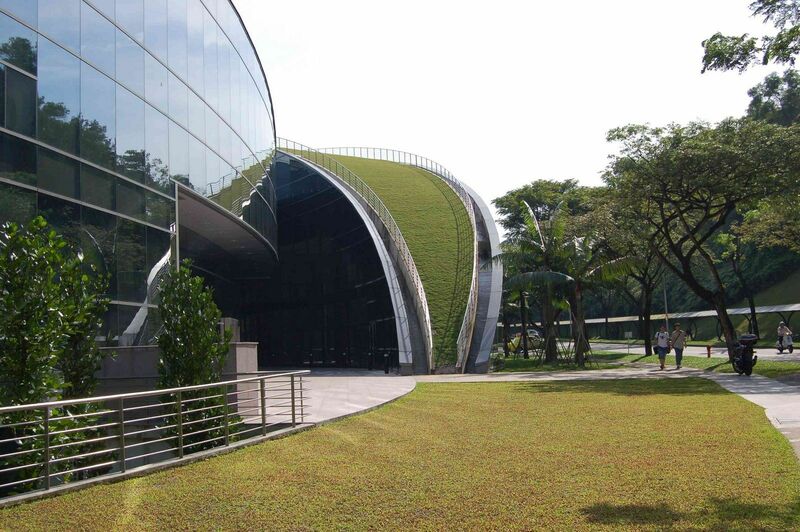 They also harvest rainwater and aid in cooling the surrounding air. 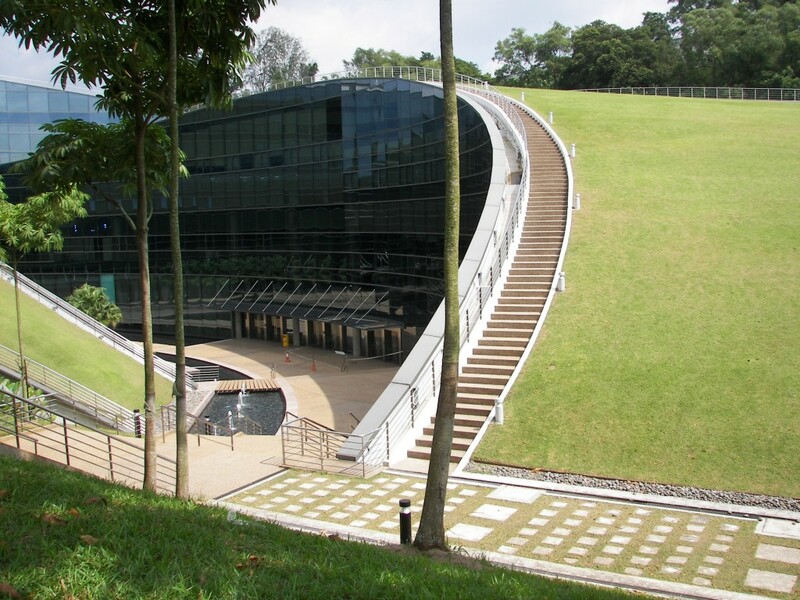 More so, the lush roofs offer outdoor gathering spaces for students, faculty and visitors, as they are accessible by stairs along the edges or directly at some points where the roof rises from the ground. 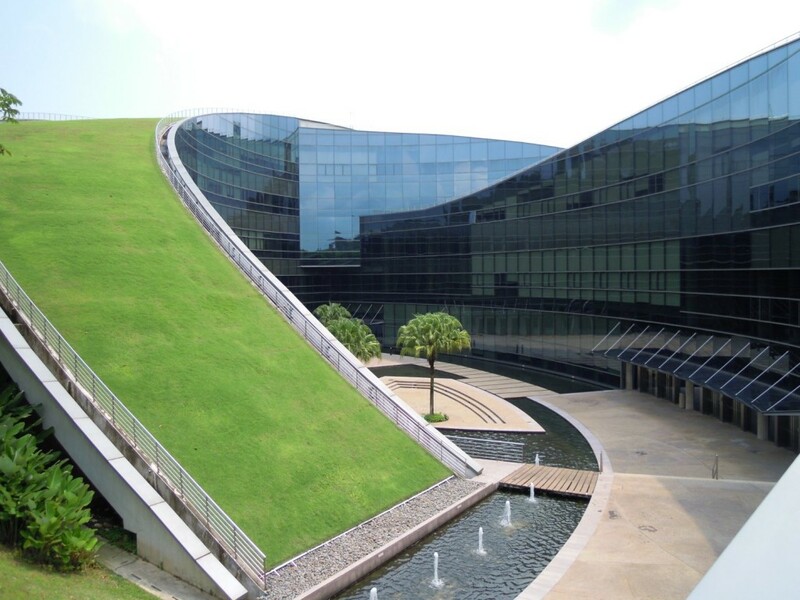 This integration of the green roof as a active functional area goes to show the type of non-linear thinking that the architects employed in crafting the design. 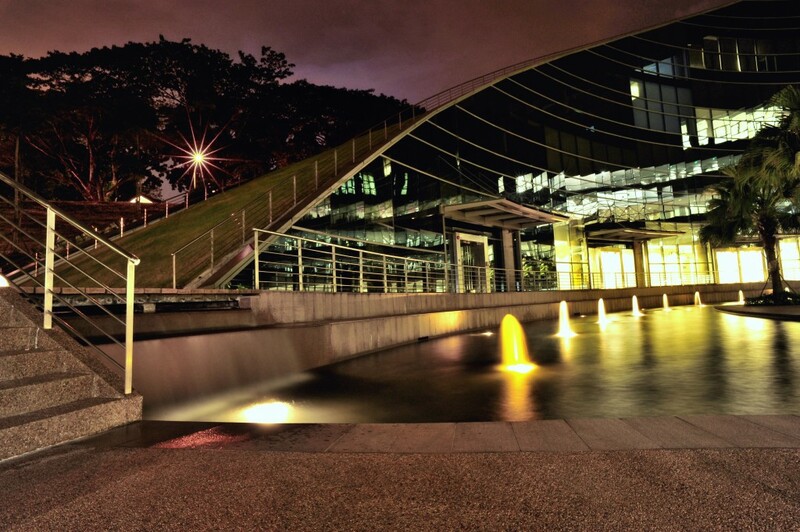 As the curves of the building embrace, at their core, we find the perfect complement to the prominent green-an elaborate water feature that surrounds a sunken plaza. 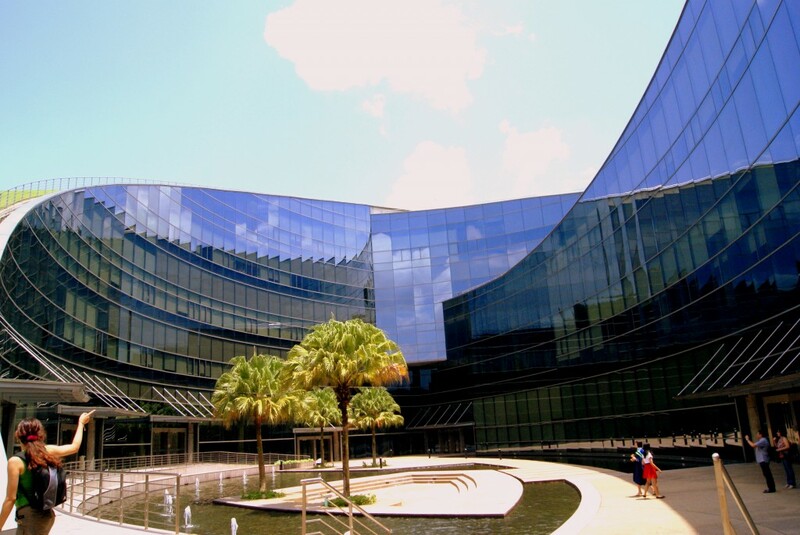 This addition of this feature, I suspect, is a nod to the idea of transparency and connectivity, which is further represented by the extensive use of glass curtain walling. 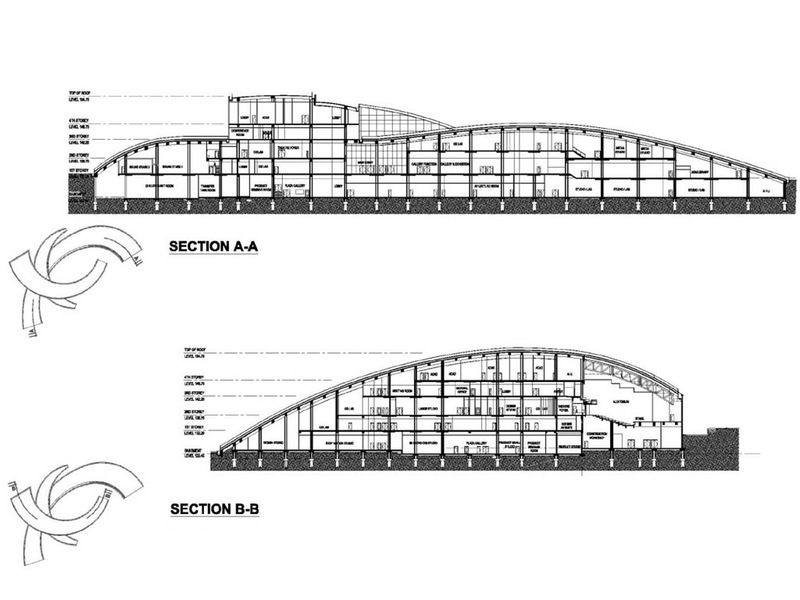 The same sense of continuity that characterizes the exterior flow of the building also runs through its interior. From the main entrance foyer to the various spaces inside, glass walling enhance a visual connectivity that allows users see beyond rooms and as a result promote even more interaction. The glass facade equally offers full exterior views that again connects visually with the user. This use of glass and intelligent lighting design cause the building to mimic a lantern at night, permitting a passerby on the ‘outside’ observe the activities and goings-on taking place on the ‘inside’ nodding to the previously mentioned transparency. The design approach, thought process and resultant product of CPG’s work are sure to be an inspiration to the students that make use of the building and I’m fairly certain that singular fact, in and of itself enhances the experience of learning here. 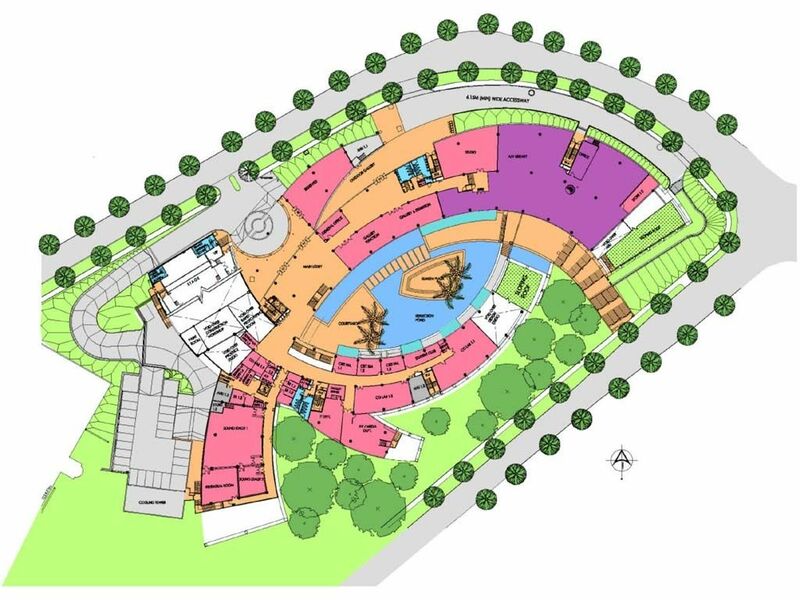 If you’d like to learn more about the science behind the building design, this very detailed 45 page report on slideshare by Adila Zaas would be invaluable. Enjoy.